The name wild leek can also refer to Allium ampeloprasum, a species native to Europe. The name spring onion can also refer to scallions. Allium tricoccum (commonly known as ramp, ramps, spring onion, ramson, wild leek, wood leek, and wild garlic) is a North American species of wild onion widespread across eastern Canada and the eastern United States. Many of these English names are used for other Allium species, particularly Allium ursinum. Allium tricoccum was first named in 1789 by the Scottish botanist William Aiton, in Hortus Kewensis, a catalog of plants cultivated in London's Kew botanic garden. The species had been introduced to Britain in 1770. The specific epithet tricoccum refers to the possession of three seeds. This treatment is followed by other sources (e.g. the Flora of North America), although the two taxa are sometimes treated as two species, Allium tricoccum and Allium burdickii. A. tricoccum var. burdickii was first described by Clarence Robert Hanes in 1953; the epithet burdickii is in honor of Dr. J.H. Burdick who pointed out differences between what were then regarded as different "races" in letters to Asa Gray. The variety was raised to a full species by Almut Gutter Jones in 1979. The two varieties are distinguished by several features. A. tricoccum var. tricoccum is generally larger than A. tricoccum var. burdickii: the bulbs are larger, the leaves are usually 5–9 cm (2.0–3.5 in) wide rather than 2–4 cm (0.8–1.6 in) wide and the umbels typically have 30–50 flowers rather than 12–18. Additionally, the leaf stalks (petioles) and leaf sheaths are usually purplish in var. tricoccum and white in var. burdickii. The leaves of var. burdickii also have less distinct stalks than those of var. tricoccum. In Canada, ramps are considered rare delicacies. Since the growth of ramps is not as widespread as in Appalachia and because of destructive human practices, ramps are a threatened species in Quebec. Allium tricoccum is a protected species under Quebec legislation. A person may have ramps in his or her possession outside the plant's natural environment, or may harvest it for the purposes of personal consumption in an annual quantity not exceeding 50 bulbs or 50 plants, provided those activities do not take place in a park within the meaning of the National Parks Act. The protected status also prohibits any commercial transactions of ramps; this prevents restaurants from serving ramps as is done in the United States. Failure to comply with these laws is punishable by a fine. However, the law does not always stop poachers, who find a ready market across the border in Ontario (especially in the Ottawa area), where ramps may be legally harvested and sold. Ramps are considered a species of "special concern" for conservation in Maine, Rhode Island, and Tennessee. They are also considered "commercially exploited" in Tennessee. Ramp festivals may encourage harvest in unsustainable quantities. The community of Huntington, WV holds an annual ramp festival referred to as Stink Fest. It is hosted by The Wild Ramp, an indoor farmers market. 1 2 3 "Allium tricoccum". World Checklist of Selected Plant Families. Royal Botanic Gardens, Kew. Retrieved 24 May 2014. ↑ "Allium tricoccum information from NPGS/GRIN". USDA GRIN Taxonomy. 23 January 2007. Retrieved 2 February 2012. ↑ "Cultivation of Ramps". North Carolina State University. Retrieved 19 February 2014. ↑ "Search for Allium tricoccum". World Checklist of Selected Plant Families. Royal Botanic Gardens, Kew. Retrieved 24 May 2014. 1 2 McNeal Jr., Dale W. & Jacobsen, T.D. "Allium tricoccum". In Flora of North America Editorial Committee. Flora of North America (online). eFloras.org. Retrieved 21 August 2016. ↑ "ITIS Standard Report Page: Allium burdickii". Retrieved 21 August 2016. ↑ "Allium tricoccum". Thismia.com. Retrieved 21 August 2016. ↑ "Regulation respecting threatened or vulnerable plant species and their habitats". Gazette officielle. Éditeur officiel du Québec. 1 May 2014. Retrieved 19 May 2014. ↑ "Garlic lovers answer the call of the wild". Globe and Mail. 21 May 2007. Retrieved 19 May 2014. ↑ "NRCS: USDA Plants Profile and map: A. tricoccum". USDA. Retrieved 19 May 2014. ↑ Core, Earl L. (15 April 1973). "Cult of the Ramp Eaters". Charleston Gazette-Mail. Reprinted in the same author's book: Core, Earl L. (1975). The Wondrous Year: West Virginia Through the Seasons. Grantsville, West Virginia: Seneca Books. pp. 46–51. 1 2 3 Zeldes, Leah A. (5 April 2010). "Ramping up: Chicago by any other name would smell as sweet". Dining Chicago. Chicago's Restaurant & Entertainment Guide, Inc. Retrieved 2 May 2010. ↑ Hugh Merwin (23 April 2013). "How Ramps Became Spring's Most Popular, and Divisive, Ingredient". Grubstreet. Retrieved 21 August 2016. ↑ Adam Martin (20 April 2012). "Cult of Ramps Begins Worship Season Early". The Wire. Retrieved 21 August 2016. ↑ William Porter (23 April 2014). 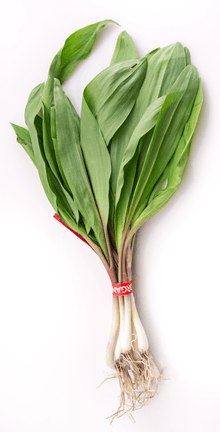 "Ramps: How to cook and where to find this savory spring treat". Denver Post. Archived from the original on 26 April 2014. Retrieved 21 August 2016. ↑ Block, Eric (2010). Garlic and Other Alliums: The Lore and the Science. Cambridge, UK: Royal Society of Chemistry. ISBN 978-0-85404-190-9. ↑ Davies, Dilys (1992). Alliums: The Ornamental Onions. Portland: Timber Press. ↑ Woodward, Penny (1996). Garlic and Friends: The History, Growth and Use of Edible Alliums. South Melbourne: Hyland House. ↑ "Ramp Festivals, Feast of the Ramson Ramps". Retrieved 17 February 2013. ↑ "Ramps & Rails Festival". West Virginia Department of Commerce. Retrieved 17 February 2013. ↑ "Cosby Ramp Festival". Tennessee Vacation. Retrieved 17 February 2013. ↑ "Flag Pond, Unicoi County, Tennessee". Retrieved 26 October 2011. ↑ "Whitetop Mountain Ramp Festival". Grayson County, VA website. Retrieved 17 February 2013. ↑ Core 1975, p. 51. ↑ "The Wild Ramp". 5 August 2016. Retrieved 21 August 2016. ↑ Rebekah Pewitt (18 April 2015). "Stink Fest Brings Big Crowds to the Huntington's West End". Retrieved 21 August 2016. ↑ Swenson, John F. (Winter 1991). "Chicago: Meaning of the Name and Location of Pre-1800 European Settlements". Early Chicago. Retrieved 22 May 2010. ↑ Miller, Tom D. (5 October 2012). "Jim Comstock". West Virginia Encyclopedia. Retrieved 17 February 2013. ↑ "Ramps in the Ink". Goldenseal. 20: 23. Winter 1994. Comstock had been inspired by the scratch-and-sniff advertising for perfume and coffee in several local papers. The issue in question announced the Richwood Ramp Supper by lacing the printer's ink for the spring issue with ramp juice. According to Comstock, "We got a reprimand from the Postmaster General ... And we are probably the only paper in the United States that's under oath to the federal government not to smell bad". ↑ Davis, Jeanine M.; Greenfield, Jacqulyn. "Cultivating Ramps: Wild Leeks of Appalachia". Purdue University. Archived from the original on 10 May 2011. Retrieved 6 May 2011. Davies, D. (1992). Alliums: The Ornamental Onions. Portland: Timber Press. ISBN 0-88192-241-2. Woodward, P. (1996). Garlic and Friends: The History, Growth and Use of Edible Alliums. South Melbourne: Hyland House. ISBN 1-875657-62-2.